This same doctor who is struggling with these new documentation requirements is now SHAMED by their organization. The usual grumble goes, "What is wrong with you? Why can't you get this done? You need to clear your chart backlog or there will be consequences." PHYSICIAN LEADERS ... Head's Up Here. We can find the struggling doctors easily. Ask IT to probe the EMR system to see which doctors are logging in to chart from home more than twice a week. You can use resources that are just lying around in your organization. Here's what I have seen in every organization I have ever worked with. 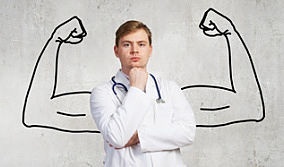 For every doctor who is struggling with their EMR chores, there is a hidden Power User - right there in the same department. Now it is not safe in many organizations for people to know you like the EMR and think it is an improvement over the old way. Power Users tend to keep their head down. AND there are providers right there in the same department who get home only moments after the last patient leaves, with all their charts done and never complain about the EMR. That is the definition of a Power User. The nurses know who these people are, just ask them. You can tap the Power Users to teach the doctors who struggle with EMR how to do a better job. Remember, the Power Users are physicians seeing the same patients and using the same EMR as the strugglers. They hold the keys to all the physicians implementing EMR optimally and everyone getting home on time. What is your Power Tip for getting your charting done?